I love a good pork chop. The other white meat is a-okay with me, and I am always trying to find a great new way to cook them up. 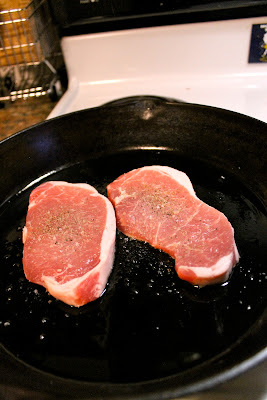 I have been experimenting a lot with pork chops and various recipes these past couple of months and this is one of my favorite ways to make them. I hope you will all like them as much as I do!! This recipe is very easy to execute and doesn't take too much time, making it the perfect weeknight recipe. Who knows, maybe it'll become a favorite of yours! This is also a dinner for two, but don't worry, it can be easily doubled! Now, for this recipe I am using boneless chops because that's just what was on sale. You can use the bone in variety as well, just keep in mind you'll want to increase your cook time a bit as well. 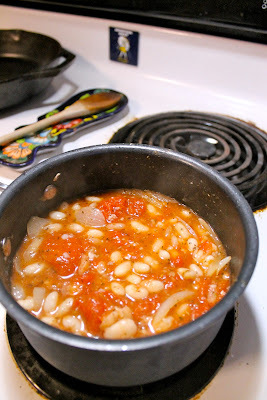 Also, I use great northern beans in my recipe, but you could also use cannellini beans. Any white bean will do. I'm making the beans in a saucepan. It's basically like a saucy beany concoction that you serve the chops over top. Mmmmmmmmm. So, we are starting with a little olive oil in the pan, heating over medium high heat. Add 1/2 of an onion, sliced as well as two cloves of garlic. Sauté them a couple of minutes. And then your spices which is basically 1/2 teaspoon dried basil, a dash of cayenne, and some salt and pepper. Bring it to a boil, and then simmer covered until ready to serve. Now that your sauce is simmering away, it's time to tackle those chops. Heat your skillet over medium high heat. Add a touch of oil. Salt and pepper your chops. Cook for 10 minutes--that's 5 minutes each side--turning once. You know they are ready when the internal temperature reaches 160 degrees. When you are ready to serve, spoon a large helping of the bean/tomato mixture onto the plate. 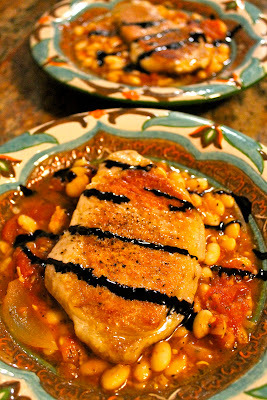 Serve the pork chops over top of the beans, and, if desired, top with a balsamic reduction. I snagged a great balsamic reduction at my local Home Goods store!!! 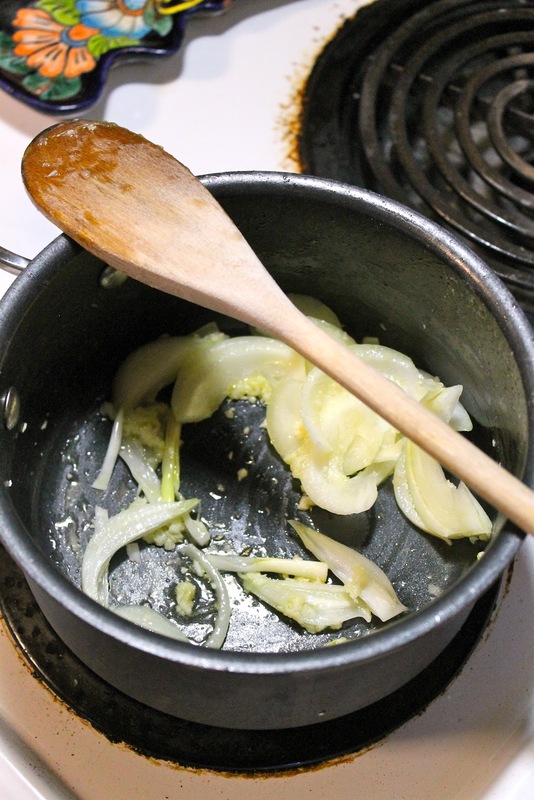 In a small saucepan, add a bit of olive oil (a tablespoon is good) and heat over medium high heat. Add garlic and onion. Sauté 3-5 for until onions are becoming translucent. Add the tomatoes (with the juice) and the beans. Stir in your basil, cayenne, salt and pepper. Bring it all to a boil, and then reduce the heat and cover, allowing the beans and tomatoes to simmer until you are ready to serve. In a skillet, add another bit of olive oil and heat over medium high heat. 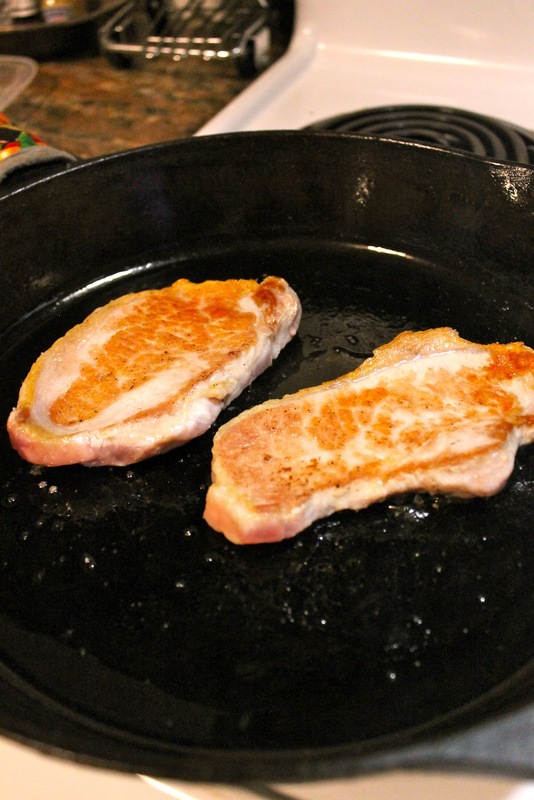 Add the chops to the pan and cook them for ten minutes, turning once at the five minute mark. You want the internal temp to be 160 degrees--that's the magic number. When you are ready to serve, spoon your beans and tomatoes generously onto a plate and place the chop on top of the beans. Finish with a little balsamic reduction, if desired.